Our plans from last week got a little disrupted. One by the snow that we had, and the other by the boiler. Which might I add has finally been fixed! This was the first bit of snow that Emily has ever seen. I think I was more excited then her, Everywhere else seemed to get snow way before us. I kept seeing all of these snow pictures and I was so envious, but it finally reached us and I couldn't of been happier. We got a light dusting to start with, I thought it would just melt and that would be the end of it. However when I woke up in the morning it was absolutely covered in snow. Granted it wasn't as much as other parts of the country got but it was enough for Emily to enjoy. Thankfully we got to enjoy it before it all melted. 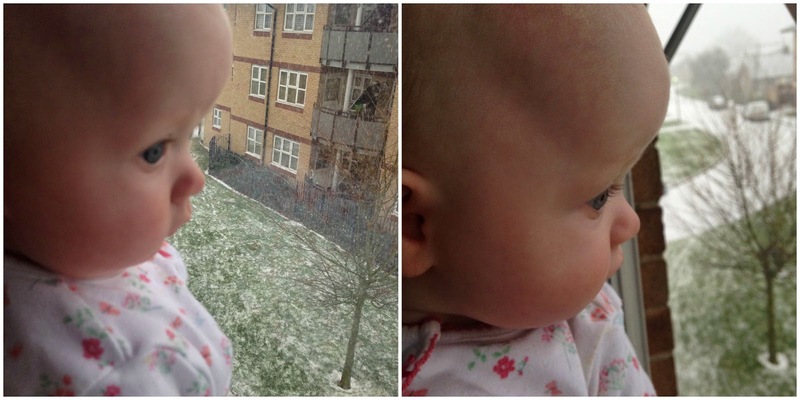 I'm thankful that I live in a flat with a balcony, because Emily sat on the balcony in her bumbo and got to feel the snow, and play with it. She loved watching it fall from the sky, but every time it touched her face she would shake it off and shiver. It was really cute. So I thought I would share some pictures with you that I will treasure forever.